I love Ridley road market with it’s African fabrics, cheap food stalls and fishmongers. Even the sheeps’ heads add a little “je ne sais quoi” to the atmosphere. This is where you come to get cheap fruit and veg in east London. Unfortunately, it’s not always the best quality. Yersterday, I was walking through Ridley Road when a torrential downpour started. This wasn’t your usual London drizzle, it was like monsoon had hit us. Fortunately, it was still warm and somehow all the people caught in it – like yours truly – were in good spirits. The market stall holders were trying to get rid of all their produce as quickly as possible and pack up, so I got 2 big bowls – one of cherries, one of strawberries -for £1.50. The cherries were delicious, but the strawberries were a bit squashed by the time I got them home. I ate the solid strawberries whilst contemplating what I could do with all the squashed ones. Half of the squashed ones went into a healthy shake with yoghurt, almond milk, maple syrup and maca root. 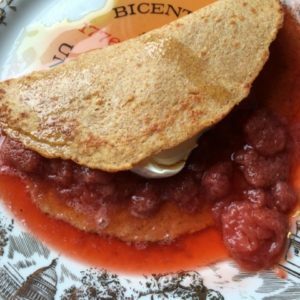 The other half were made into strawberry and vanilla sauce that went on top of spelt pancakes this Sunday morning, for brunch. I won’t lie to you, it was divine. I simply simmered the strawberries with a teaspoon of good quality vanilla essence, a tablespoon of brown sugar and 3 tablespoons of water. I won’t patronise you with a detailed description of how to make pancakes because I’m sure you know. I just whizzed all the ingredients down there together and fried each ladlefull in little knobs of butter. I also added a dollop of mascapone and a drizzle of maple syrup for that American brunch feel. This will make 2 pancakes.